This game is a full featured multiplayer dice simulator. 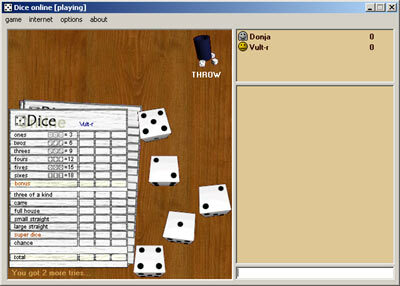 Every player gets three attempts to throw several combinations of dices as shown on the scoretable. After three attempts every player is forced to write his/her score. This free dice simulator keeps track of the scored points as well. Here is a detailed list with the most important free multiplayer dice simulator features to give a good idea about the dice simulator. - Download dice simulator free of charge. - Free multiplayer dice game. This is a screenshot of this free dice simulator. The screenshot is resized to fit on the website. The size of the actual game is bigger.